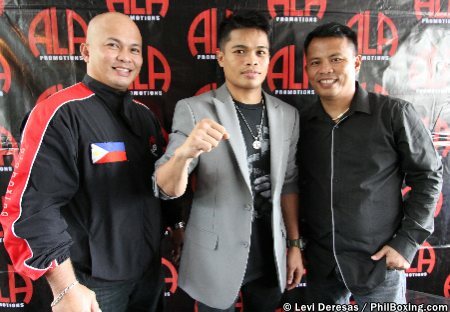 CEBU CITY – World title challenger Jonas Sultan who will be accompanied by his trainer Edmund Villamor and stablemate and the Philippines' longest reigning world champion Donnie Nietes, will leave for Los Angeles tomorrow, May 4, ahead of his upcoming historical fight against reigning IBF world superfly champion and compatriot Jerwin Ancajas on May 26 at the Save Mart Arena in Fresno, California. Team Sultan faced the Cebu boxing media Thursday noon at the Park Social at the Cebu I.T. Park here. 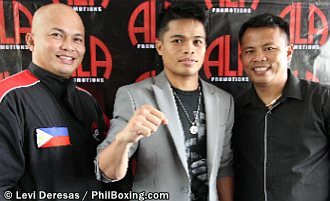 Team Ancajas, meanwhile, are scheduled to leave on May 15. Sultan and his trainer Edmund Villamor said they are ready for Ancajas. Sultan, meanwhile, said he is ready for whatever Ancajas will bring to the table. “If he boxes, I'm ready for that. If he wants to fight close, I'm also ready for that. I think also I have boxing smarts,” Sultan, who had already beaten two former world champions, said. Jonas Sultan (C) poses with trainer Edmund Villamor (L) and Edito Villamor (R) at the Park Social in Cebu City Thursday a day before their scheduled departure for the United States. Sultan acknowledged that he is the underdog in this fight and he recognizes Ancajas's growing popularity. But his desire to win this fight is not to become popular or become a star. “My goal as a boxer is to win a world title. That is my goal. So I don't want to miss this opportunity that is now in front of me. I just don't want my boxing career to go in vain,” Sultan said. Sultan, 26, hails from Zamboanga del Norte in the southern Philippine island of Mindanao. He has a record of 14 wins, nine inside the distance, and 3 losses. He became Ancajas' mandatory challenger after beating former two-division world champion Jonriel Casimero last September. Ancajas, also 26-years-old, was born in Panabo, Davao del Norte, also from Mindanao but now resides in Magallanes, Cavite in northern Philippines. He has a record of 29 wins (20 by knockout) and only one loss. He won the IBF superfly title from McJoe Arroyo of Puerto Rico on Sep. 3, 2016. He had successfully defended it four times the last one against Israel Gonzalez of Mexico last February in Corpus Christi, Texas. Sultan is slated to finish his training at Freddie Roach's Wildcard Gym in Hollywood until May 19 and afterwards leave for Fresno for the fight week activities. Nietes will also begin training at Wildcard Gym for his upcoming fight against compatriot Aston Palicte tentatively scheduled in July. Nietes and Palicte will vie for the vacant WBO world super flyweight championship. The pair of world championship matchups among Filipinos this year are the first since hall of famer Pancho Villa (Fernando Guilledo) defended his world flyweight title against Clever Sencio in Manila in 1925.